Black Sabbath might just be the perfect Halloween band. The perfect Black Sabbath tribute band, Sabbath Bloody Sabbath, will be testing that theory on the Bruce Latimer Show at 9 p.m. tonight, Oct. 25, on Pacifica Community Television Channel 26. Drummer Sab-Head Pete, who also founded and manages the band and is from Pacifica, will be there along with his bandmates. 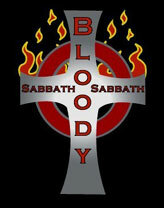 Check out the group's website at www.sabbathbloodysabbath.com or their MySpace site. (Yeah,they have a MySpace site, Don't you?) Oh yeah, when he's not rocking with Sabbath Bloody Sabbath, Sab-Head Pete is an elementary schoolteacher. And if you just can't enough Sabbath Bloody Sabbath, the "World's Greatest Black Sabbath Tribute Band" plays a Halloween Bash off Folsom in San Francisco this Friday, Oct. 27th, beginning at 10 p.m.
One of Pacifica’s favorite bands will bring their familiar rock-n-roll smack down for a Halloween spook-it-all on Saturday night. “Sabbath Bloody Sabbath” will be performing at Molloy’s Tavern (1655 Old Mission Road) in Colma at 9:30 pm to romp up the fun, along with a costume contest, haunted house and prizes. The event is all ages, so bringing the younger people along would be great! This four-piece band creates/re-creates a sound that drenches the room with the essence of those original classic heavy metal icons, “Black Sabbath.” The musicians, “Sab-Head” Pete (drums), Markus Daiemeion (lead vocals with a four octave range), Dale “Iommi” McDermott (lead guitar) and David DeSilva (bass) have been playing together in this tribute band since 1996, and they have become a bay-area favorite. How else should anyone spend their Halloween, than going out to enjoy the type of evening Molloy’s is planning with SBS? All the Halloween fun can happen for folks in one place, which is always nice. Although SBS is most definitely a tribute band, they still manage to keep some of their own in the music, which will effectively blow the listener out of his/her seat. In fact, don’t even think about sitting down. Resistance is futile, since the sound is a pound for pound seduction to get up and body slam your neighbor (not recommended for persons with back trouble). Markus Daiemeion on vocals and McDermott on guitar are a match made in metal heaven embracing a power house dual eclectic that simply refuses to disappoint, and the overall “ambiance” (if you will) of the ensemble absolutely works, even when the music reaches through the occasional necessary dissonance. This event should not be missed! So don your Halloween best, including those leathers, and jam on down to Molloy’s this Saturday night for some rock-the house Sabbath Bloody Sabbath mayhem and some “horrific” holiday fun. Trick or Treat! If you are tired of the same old, same old and want to discover a new beat that sends you to the moon and you never want to return, haul yourself over to Winters Tavern at 9 p.m. this Saturday night for a taste of SABBATH BLOODY SABBATH, a re-creation of Black Sabbath in full Black Sabbath costume and yet very much their own sound. Your ears will ring, your head will burst and you will be mesmerized like it or not. This group makes magic music that locks you in its grip. The band was founded by SAB-HEAD PETE on Halloween 1996 in Pacifica. They have headlined in bay area clubs ever since. They are described as classic rock with jazz and blues influences but words don’t do them justice. They encompass the audience, devour the room. They are …well you have to hear and see what they are because no description can tell it all. Sab-Head Pete is the band’s leader and is known for his amazing note for note drumming and gigantic passion for the band. The lead vocals are done by Markus Daiemeion, an experienced true heavy metal front man for over 10 years. He has great stage presence, image and an amazing four-octave range, a voice that is powerful as an explosion and an attitude never seen anywhere else on this earth. Dale “Iommi” McDermott is the lead guitar and his very presence defines the sound that makes the band so very special. David DeSilva is one of the greatest bass players to burst into the club scene and now he too is part of this unbelievable Pacifica based group. His image, enthusiasm and commitment make him the ultimate Geezer Butler. This unique band is a novelty among tribute bands. They are a scene, a sound, and an excitement rarely seen and never heard before. Sab Head Pete gathered these masterful music makers together to blow the roof right off the music world and set feet moving, toes tapping and voices shouting to a brand new kind of sound. Sabbath Bloody Sabbath will be at Winters Tavern, 1522 Francisco Blvd. this Saturday from 9 PM until they drop or the bar closes. Don’t miss them. They are unbelievable and, an excitement yet to be matched.